Jeans can be the bane of all our existence. Especially in our 30s. Jeans do not fit the same as they did when we were in our 20s. 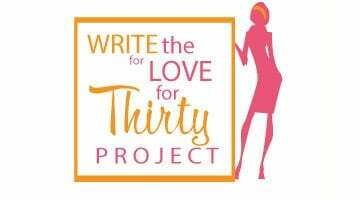 From having kids, gaining or losing weight or just our body changing with age, it can be a hot mess trying to find a good pair of jeans that don’t look like “mom” jeans, give us the comfortability that we crave, and actually flatter our changing body’s. Keep in mind, that finding jeans doesn’t have to take all day to find. There are such things as denim specialists that can make suggestions, but the magic to the best pair is the individual fit. 1. When trying on jeans, notice if they go on easily. If they do, go down a size. Struggling to get into the legs is a key to finding good jeans. Jeans always stretch. 2. The waistband should be snug. Try to fit two fingers down the back. If you can fit your whole hand, they are too loose, if only one or no fingers, too tight. 3. Look for a curved, or pieced waistband. meaning it will be slightly higher at the back than the front and will curve into your waist rather than sit straight up. 5. Make sure there is no ‘grab’ room at the crotch. 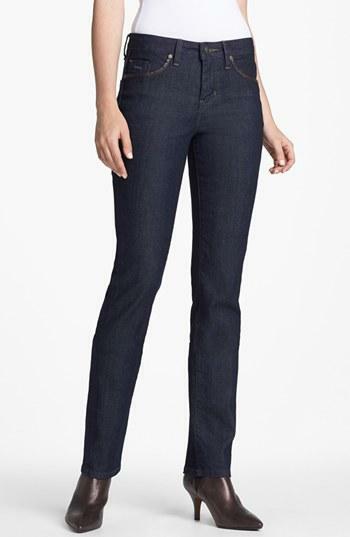 The jeans should be nice and firm when you buy them, and loosen with wear. 6. Memory is a must when buying jeans with a lot of stretch. 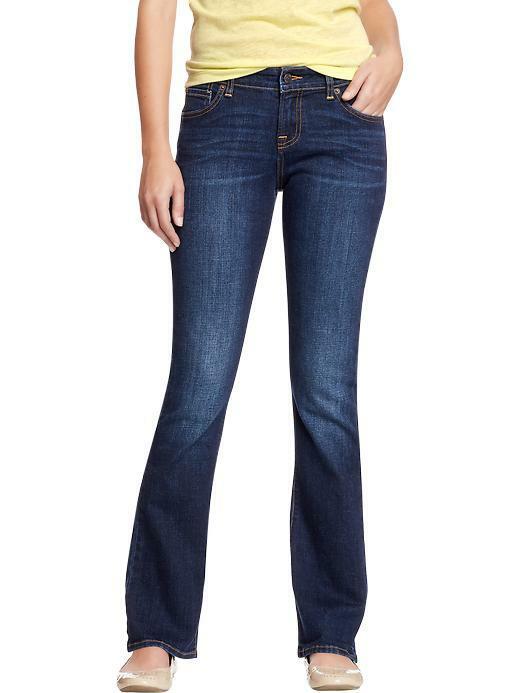 Look for a good quality denim that has great “memory,” meaning the denim springs back after you wear it. 7. When buying jeans with super stretch buy them firm but not overly tight. If you have ‘seam strain’ (the seam is pulling apart) down the legs, they are possibly too tight and this could damage the stretch. 8. 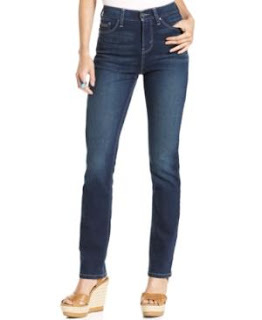 When you’re shopping for white jeans, you want to look for jeans with faux front pockets. If you find white jeans with pockets, you can hire a tailor to remove them for a neater and slimming look. 10. Pear shaped or curvy ladies who like skinny jeans should look at high waisted styles – it elongates the leg and slims down the hip. 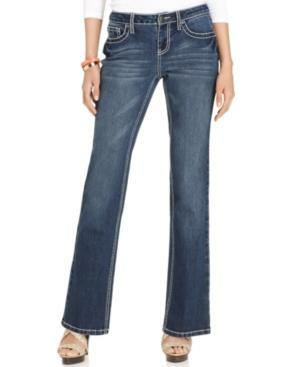 Bootcut will also help balance out your figure. 11. Apple shaped girls should look for plenty of stretch in a straight leg in a dark wash as they are the most flattering. 12. Boyish shapes can wear most styles. Add some shape and interest with zips and details on back pockets. 13. Long legs look best in a mid to low rise to keep the waist at the right height. 14. Petite girls look great in a high rise that accentuates the waist and elongates the legs. 15. Don’t be afraid to hem cropped jeans. People often think that if cropped jeans aren’t the right length then they’re not the jeans for them, but cropped jeans should be hemmed to fit properly, just like a bootleg or straight leg. 16. When having your jeans hemmed for flares take the shoes you want to wear with them to the fitting. You should decide on the shoes and stick with those shoes for your flares. 17. When having your jeans hemmed make sure the tailor always measures them from the back of the leg, i.e. at your heel, otherwise they may come back too short. 18. 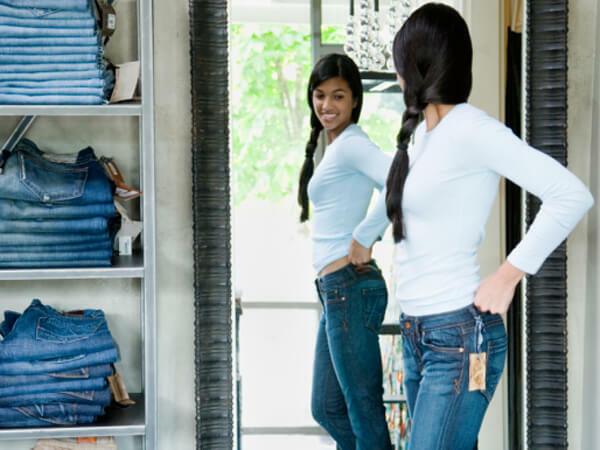 Alterations can give you the perfect jeans. Think about adjusting the waistband or slimming the legs – small adjustments are not unusual. 19. Read the care instructions when washing. Most premium jeans are best washed COLD, any warmer and you are damaging the fabric. 20. Don’t stress too much when it comes to finding jeans. And remember, it is still a classic and fab look to wear them with a simple white tee. Great tips!! Thanks so much!! Thanks so much Crystal! Glad you found them useful! 100 times thanks for these great tips. I always have problem with jeans’ size – they are either too loose or so tight, that at the end of the day I have tummy ache. Next time when I buy jeans I will try this hand trick to choose the right size. Low Rise Jeans are perfect fit for slim girls and it looks hot. Super helpful tips! For better=fitting clothes, I recommend having your measurements taken by a professional seamstress. That way, you have a better shot a buying the right clothing size. And even if the fit is not ideal, you can always go back to the seamstress and have it re-fitted. Personally, my main priority when buying jeans is the fit. It needs to be comfortable. I need to freely move while wearing it. If they don’t those pants have got to be returned. Oh, and just to add to my previous comment, I think shoppers should also try to learn how to navigate their way around the complicated world of jeans sizes. This article (https://www.blitzresults.com/en/pants-size/), for example, discusses how various sizing systems work for pants and jeans. Conversion tables for both men and women’s sizes are also available. I am hoping to get some new skinny jeans and I did not realize that there are so many things to think about when choosing jeans! You make a great point that you should find out if the jeans go on easily because this means that they will stretch and get too big in the future. Also, I appreciate that you say to look for jeans that have high wasted styles because it will elongate and slim my legs.